Winter blues really have set in the past week or so and I’m finding it hard to get into these fishing reports but leading up to what I think will be the best months fishing you should start seeingÂ a few more reports. 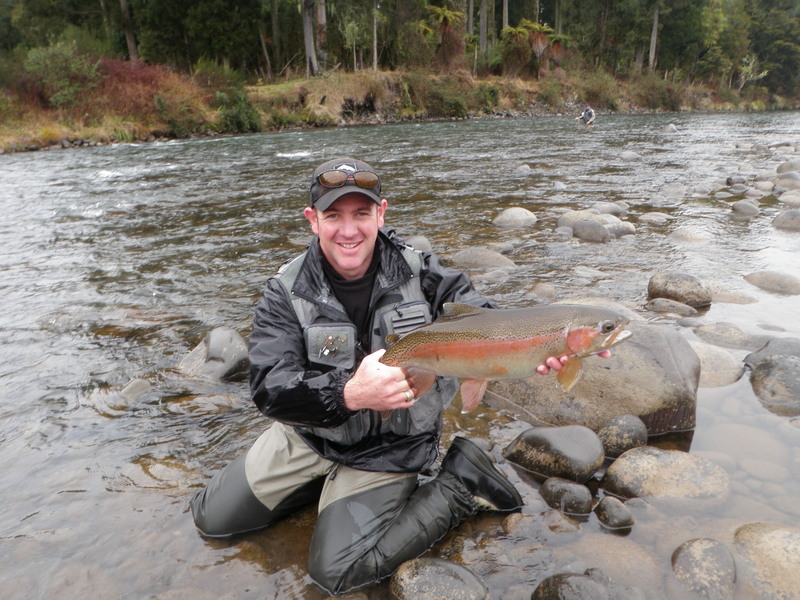 Spawning runs in Taupo have been getting later all the time and some of the best fishing on the Tongariro can be had in October-November! Some rain would still be handy and spurr things along encouraging some small runs into the rivers to give us something to play with. 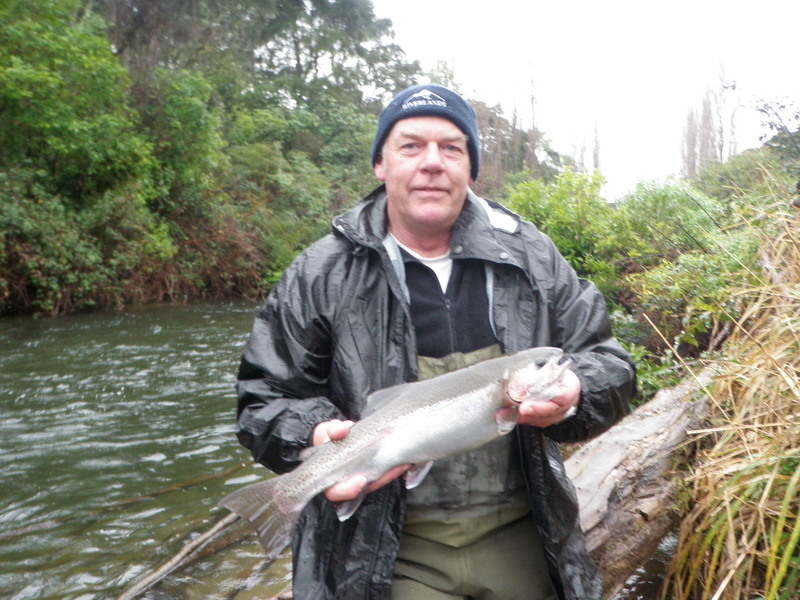 Taupo has received some patchy rain but nothing that has really moved any levels in any of the rivers but if you were in the right place at the right time you would benefited fromÂ a small pule of fish which this rain pushed into the rivers. I was lucky enough to find one of these rare pulses of trout while guiding Brett and he made the most of if by hooking into several silver bullets which had some real go in them as they were so fresh from the lake. We fished the upper Hine in the morning and had a pretty quiet morning with only two or three fish falling toÂ small naturals but with all the rain we were getting I thought it might be worth a look below the bridge and sure enough we were in. Fish were literally running past our feet and as long as you had your glo bug in the water something grabbed it every few casts. These fish were not huge but they were fish and in very good condition. Trout this winter are moving through rivers very quickly and from what I saw on this morning they could be well into the middle reaches of this river in several hours not giving the angler much chance to encounter them. 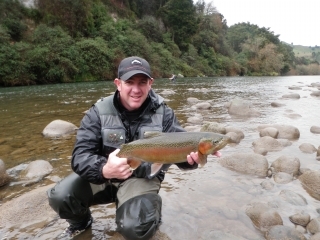 The Tongariro still has plenty of trout scattered throughout the river but anglers are still having problems catching them . Anglers should be applyingÂ stealth mode and fishing for this cunning trout as if it was the summer,anglers which are seem to be getting quite good numbers. All the major pools have heaps ofÂ trout in them as you can see them from most bridges so there should not be any reason why they cant be caught-they’re only fish!! The Tongariro is very clear and all the stones have been turned over nicely creating some dream runs for nymphers so just apply the summer methods and you should push the odds back in your favour. 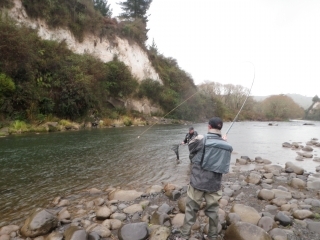 I stepped out of the comfort zone and wondered up the Tauranga Taupo the other day and was very disappointed with the amount of fish which are holding in here. The water looks amazing and I believe it has some of the best looking water of any of the rivers in Taupo yet it doe snot seem to be holding very well. I was not surprised as the reports I have heard are like most rivers this winter and when trout are in here they tend to move very quickly. I used to fish this river with my Dad 10 yers ago and you could guarantee that you would have a fantastic day in here as long as it was winter. I also used to drive to nearly the Cliff pool which obviously cant be done these days as access has become very tight and limited on this river. Something which did impress me was the lack of snags in the pools as well,it seems that the floods we had last season has cleaned out most pools and created snag free pools-maybe this is why no fish will hold here either. Yesterday I ventured out with my old Dad into the backcountry and enjoyed a very wet and cold day nymphing some quite different water. There are heaps of options for you to escape from Taupo and discover new water which you may like to use over summer and that’s exactly what we were doing. 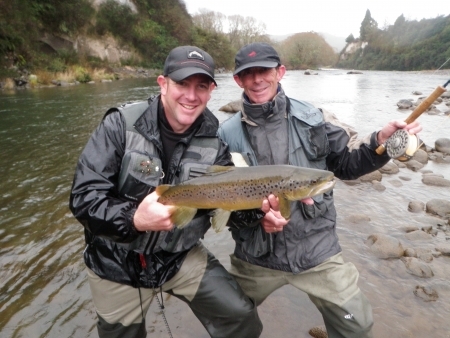 Quite often the fishing can be amazing at this time of year with heaps of trout sometimes stacked up in pools for spawning which can provide excellent fishing. Like all back country fishing most of it involves a fare bit of walking and when fishing new water it generally involves many wrong turns and deep crossings which we might not do again. This is what guide do at this time of year that when you hire us during the summer we can make sure your day does not involve too much down time due to wrong turns or accidents. As you can see from the photo’s we got into a few fish which were all in pretty good nic with the best probably being theÂ old boys brown which actually jumped three or four times -rare form in brownies. Again clear skies hang over Taupo and the threatening rain is no longer much of a threat which is dissapointing as we really need some dirty rivers for a few days. 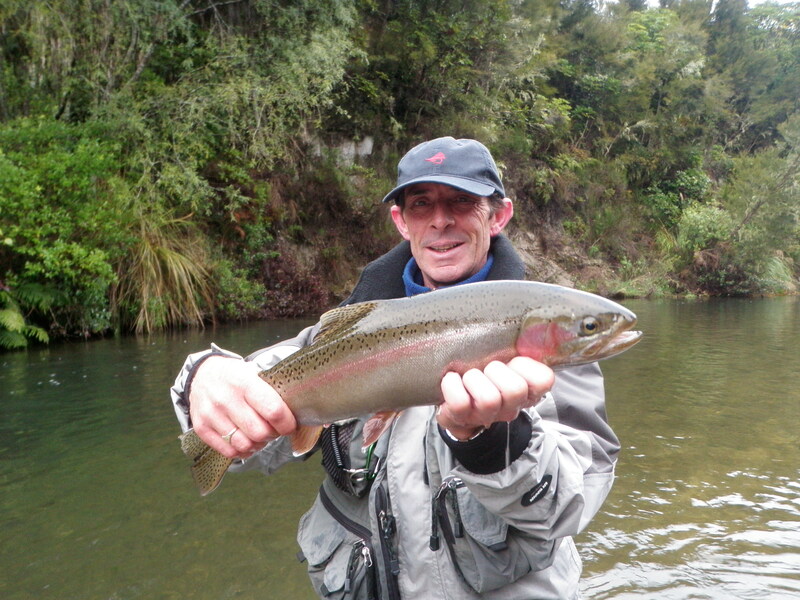 Phil Norman arrives again in the next week or so and we must turn it on for this man so hopefully nature will open up and bless us with rivers full of trout to have some fun with.